Kishani Jayasinghe is an achiever among achievers. This has reference to the stature she has been able to seek and establish in what is clearly a punishing environment. She demonstrated her talent as singer and actress on stage while yet at Visakha Vidyalaya, a leading school in Colombo. She was also a winner of a competition, conducted under the aegis of the Board of the Symphony Orchestra, referred to as the Concerto Competition”. This, too, while at school. After her exposure to the real world of grand opera” while on a Rotary Scholarship, she returned home with a determination to push the envelope and seek a career in music. This ambition took her to England. She also studied Law, in the event of a need for a fallback. But, her musical training was at the highest level, and her academic grasp of the idiom, and languages of opera was definitely at a masterly level. She also has a stamina and capacity for hard work. As to how she manages her energies and controls fear and nervousness in the arena is a secret that is hers. With her enjoying considerable success and acceptance at the topmost level in Europe’s operatic realm, she has indicated that there was something remarkable within . Especially given the near hopeless situation that confronts Asian aspirants in this creative field. This is a professional field that can boast of phenomenal talent from many European and American climes who usually dominate the whole province in this rarefied space. Clearly Kishani is on par with similarly gifted Lankan performers, of who Lanka’s people are largely ignorant. ‘Cellist Rohan de Saram, pianists Malinee Jayasinghe-Peris, and Rohan de Silva and tenor Asita Tennekoon amongst a few others, are rarely mentioned in Sri Lanka, even though their work is avidly discussed, reviewed, recorded and appreciated (and occasionally venerated!) elsewhere in the centers of the arts around the globe, both East and West. 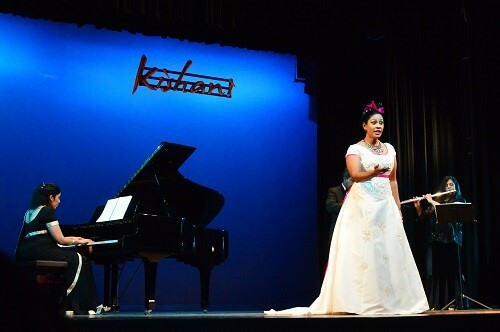 In December 2015, Kishani presented a concert at the Lionel Wendt theatre in Colombo. The musical selections were categorised as French Grand Opera, Art Songs, sacred songs, and Popular favourites, including a medley of Broadway type hits. At the December concert the song Anurādha Nagaraya was delivered in the bel canto style, by Kishani. The lyric was as originally composed. The tune was the same, the articulation in Sinhala was pretty authentic, but given the vowel intonation required in the Italian bel canto there were a few slight aberrations in the Sinhala vowel sounds, which I would consider eminently negligible. Overall, it was a stunning performance” and the audience (made up of aficionados and those who have a wider world view) was awed. They gave Kishani a standing ovation. In the audience at the Lionel Wendt Theater in December were two individuals who had paid for their two tickets (they were not issued complimentary tickets, and were not chief guests or ‘special guests’, rather, bona fide patrons.). 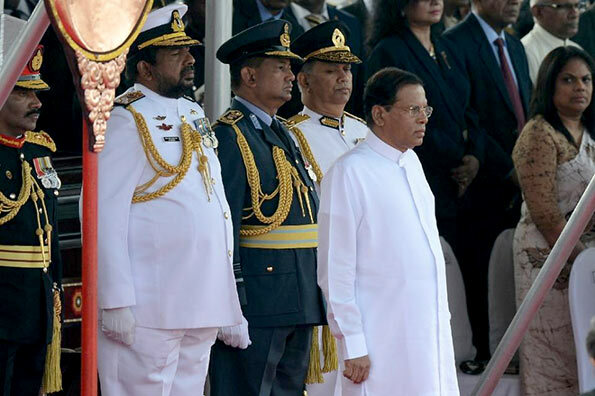 These two were Ranil Wickramasinghe, the Prime Minister, and his wife Maithree. Clearly, Mrs. Wickramasinghe was impressed with Kishani. Her enthusiasm was genuine. At the end of the concert, Maithree approached the singer, and while congratulating her, mentioned to her that if Kishani would oblige, she would like to arrange for her to sing at a State event. Kishani and her family communicated that information to me later. She was pleased that her surprise entry in the program had borne some fruitage. Kishani’s rendition on February 4th 2016, of that song and another kāvya, were in the same genre. On this occasion too, she had the vital support from her wonderfully gifted collaborator at the piano, Soundarie David-Rodrigo. At the event she wore a saree, which was different to the formal evening gown worn by her at the December concert at the Lionel Wendt.What was also quite different was the audience. The difference was monumentally evident. The vast throng would scarcely know a trombone from a tambourine, or an art song from a dramatic piece in the Kabuki. In fact, they would scarcely know what was from the Tower Hall era and what is a crib-off of a Hindi song in a movie, with lyrics in Sinhala!!!! Arun Dias Bandaranaike has been a professional broadcaster, newscaster, commentator and moderator for around 25 years, serving with the national broadcast services in Sri Lanka, the Sri Lanka Broadcasting Corporation, and Sri Lanka Rupavahini Corporation. This entry was posted on Friday, March 4th, 2016. You can follow any responses to this entry through the RSS 2.0 feed. You can skip to the end and leave a response.